Stone’s legal team argues CNN showed it a draft copy of the indictment, stamped without a PACER, after their client’s arrest, suggesting the document had been released prematurely. “A person with privileged access to a ‘draft’ of Roger Stone’s Indictment, identical to that which had been filed under seal … had – in violation of the Court’s Order – publicly distributed the Indictment prior to its release from the sealing ordered by the Court,” the filing reads. CNN denied being tipped off about the indictment, claiming that it was their reporters’ “instinct” to send a crew to Stone’s home before dawn on the morning of his arrest. “[FBI agents] walked me out in the middle of the street to make sure the CNN camera could get great footage of the whole thing. The street was sealed off, so how CNN had a camera right outside the door; that’s very hard to understand, because nobody else was allowed on the street,” Stone said of his arrest in an interview with Breitbart News Daily host Alex Marlow. On January 28, Rep. Andy Biggs (R-AZ) sent a letter to the Department of Justice asking for an investigation into whether details of Stone’s indictment were leaked to the media ahead of his arrest. Stone was charged with lying to Congress, obstruction and witness tampering related to discussions he had during the 2016 election about WikiLeaks, the anti-secrecy group that released material stolen from Democrat groups including Hillary Clinton’s campaign. U.S. intelligence agencies have said that Russia was the source of the hacked material, and last year Mueller charged 12 Russian intelligence officers in the hacking. 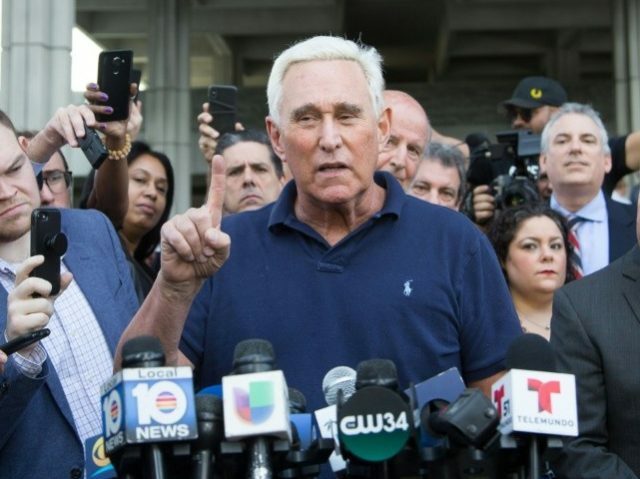 Prosecutors have tied that case to Stone’s, saying they share a common search warrant and involve activities that are “part of the same alleged criminal event or transaction.” However, they have not accused Stone of being directly involved in any Russian election conspiracy. Stone, who remains free on $250,000 bond, has denied having any direct contact with WikiLeaks. The Trump ally has said he only sought to encourage voter interest in the group’s public disclosures. He also has denied discussing the issue with President Trump. Stone pleaded not guilty to all charges.